St. Patrick’s Day is right around the corner so let the shenanigans begin! Irish food isn’t known for being healthy but we have some lucky recipes for you to serve this St. Patrick’s Day. Preheat your oven to 400 degrees. Cook the corned beef and cabbage in a slow cooker for 10-12 hours on low according to directions. Once cooked, remove the corned beef and cabbage and pull apart each leaf of cabbage and cut the stem off of each piece. Place 1/4 cup of corned beef and 2 tbsp of sauerkraut on the top of a cabbage leaf. Fold over the leaf and roll like a burrito. Place each Cabbage roll in a 13×9 cooking pan and cook for an additional 20 minutes. Preheat your oven to 400 Degrees. In medium size bowl, blend together eggs, paprika, garlic powder, pepper, and salt. Heat a 12-inch non-stick, over medium high heat. Add olive oil to pan and sauté the shallots. Stir in the cauliflower and cook covered for 10-12 minutes, stirring occasionally. Pour the egg mixture into the skillet. Carefully arrange the bell peppers on top to create a shamrock pattern if desired. Reduce the heat to low and cook until the edges are set, 6 to 8 minutes. 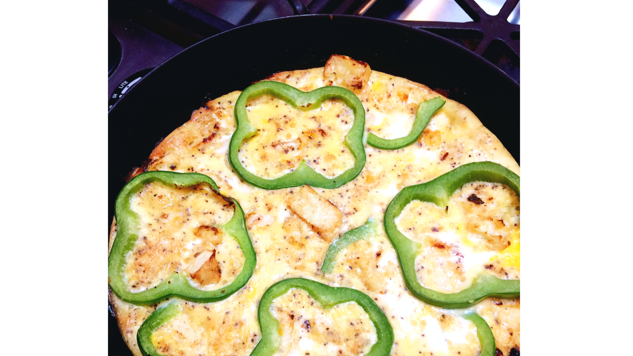 Transfer the skillet to the oven and bake until the frittata is completely set and cooked through, 8 to 10 minutes. Remove from the oven and transfer onto a large plate. Cut into wedges and serve. 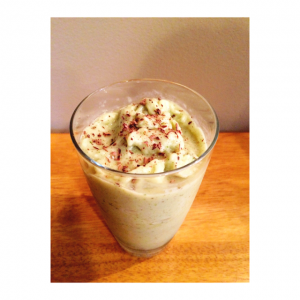 Mix the ingredients together in a blender and serve! Bring a pot of lightly salted water to a boil, add the kale and cook for 10-15 minutes until tender. Meanwhile, boil the cauliflower in a separate pot for 15 minutes until tender. Add the spring onions, chives and milk to a smaller saucepan and simmer for 5 minutes. Once the kale is cooked and drain well, removing any excess moisture. Drain the cauliflower, removing any excess moisture and mash well. If you prefer a smoother mash, use a food processor or hand held blender to puree the cauliflower. 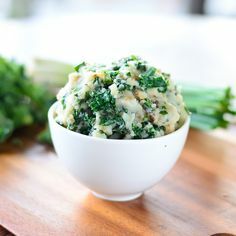 Stir in the kale, almond milk with green onions and chives, half of the butter and some salt and pepper. Taste and add more if needed. Serve warm with the rest of the butter melting on top. Perfect accompanied with chicken sausages!